Sparks, MD--Brimrose has been selected to provide a new spectrometer for a NASA payload as part of the agency’s efforts to send new science and technology demonstrations to the surface of the Moon. The instrument is to be located on a commercial Moon lander to identify water and hydroxyl and their distribution networks. The Brimrose spectrometer was selected as part of NASA’s Lunar Payload Development Program. It is part of NASA’s Commercial Lunar Payload Services (CLPS) initiative (www.nasa.gov/clps). The Brimrose spectrometer will be a part of the particular program known as the Near Infrared Volatiles Spectrometer Instrument, or NIRVSS. The instrument spans the 1300-4000 nm range, a range that allows for the identification of H2O bands. "It will be thrilling to start receiving data generated by our spectrometer from the Moon’s surface," said Vladimir Stanislavsky, chief operating officer at Brimrose. "Our core NIR AOTF technology has been used on Earth by major pharmaceutical companies, the food industry for analysis, and for many other applications, but this is the first time it will be used on the Moon to find water." Brimrose’s core Acousto-Optic Tunable Filter (AOTF) technology is being used in the spectrometer. Using AOTF, an RF signal is applied to a TeO2 crystal, producing acoustic waves within the crystal. There are a variety of advantages to this technology, including the fact that its passband wavelength can be tuned without the need for moving parts. TeO2 also is a very efficient optical material, and AOTFs have an extremely high optical throughput compared to other dispersive optics. The instrument can use the Sun or an included infrared lamp as its light source. Brimrose already has built the prototype unit, and will deliver the final product by the end of this calendar year, according to Stanislavsky. The instrument is the third generation of this particular configuration, with improvements and lessons-learned applied in each previous iteration. The final unit will undergo protoflight environmental testing prior to delivery to NASA for integration with a future CLPS delivery service. Brimrose’s ruggedized design matches well to NASA’s specifications. The spectrometer already has participated in thermal-vacuum drill testing at NASA’s Glenn Research Center in Cleveland, during which the instrument operated in lunar-like conditions and monitored drill cuttings from H2O-doped lunar simulant for water ice. The Brimrose technical team, led by Dr. Feng Jin, is working primarily with the NASA Ames Research Center team in California’s Silicon Valley. Nine U.S. companies on a CLPS contract with NASA are developing landers. Knowledge from the Moon landers used for the science and technology payloads will be applied to future human lander designs. The Brimrose spectrometer is currently scheduled for launch in the near future. A new joint venture funded by the highly respected Israel-U.S. Binational Industrial Research and Development (BIRD) Foundation is unveiling a prototype unit that can provide new capabilities in the areas of materials identification and sorting. The BrimEX 001 is capable in real time of identifying white powders that can travel through the mail, including dangerous powders such as anthrax spores, as well as quickly identifying materials at hazardous waste sites. The hyperspectral imager, which was made by U.S. partner Brimrose Corporation, and the next gen software, provided by Israeli partner File X, already is being demonstrated for U.S. defense contractors. Industry sources place the potential market for such a unit at $2 billion in the United States alone. The unit, which was funded as part of a $1.6 million award provided by the BIRD Foundation, also is generating significant attention in the plastics recycling industry. Billions of tons of waste from plastics have been generated, a number that is rising significantly every year. Only nine percent of plastics currently are recycled in the United States. The BrimEX 001 already has successfully demonstrated that it can identify many different types of plastics in near real time. Let us know if you would be interested in a demonstration of the BrimEX 001 as this product comes to market. Contacts include David Chaffee at Brimrose or Dr. Moisey Bernstein at File X. Mr. Chaffee can be reached at 410-472-7070. Dr. Bernstein can be reached at +972-(0)54-498-4366 or Moisey.Bernstein@thefilex.com. Sparks, MD—An Acousto-Optic Modulator (AOM) made by the Brimrose Corporation of America is now being implemented by NASA as part of a new facility known as the Cold Atom Laboratory (CAL) on the International Space Station (ISS). The Cold Atom Laboratory was developed at NASA’s Jet Propulsion The Cold Atom Laboratory was developed at NASA’s Jet Propulsion Laboratory and already has begun operating on the ISS. It will provide scientists with an improved set of tools for probing the realm of quantum mechanics, which is the study of nature at the very smallest scale. The AOM is considered to be the key component inside CAL for manipulating the atoms for interferometry, according to James Kellogg, CAL Engineer of Lasers and Optics at the Jet Propulsion Lab. It is a fiber-coupled, solid-state device that can tune laser light to very specific frequencies while switching on and off in less than 100 nanoseconds. Brimrose also makes a free space version of the AOM. The CAL facility will produce clouds of ultra-cooled atoms called Bose-Einstein Condensates (BEC). These are chilled to a fraction of a degree above absolute zero, or even colder than the average temperature of deep space. The atoms in a BEC demonstrate quantum characteristics at relatively large-size scales, allowing researchers to explore this strange domain with greater understanding. To reach these ultra-cold temperatures, the CAL uses a three-step process. First, lasers are used to corral the atoms and slow them down, stealing their energy and reducing the temperature to approximately 100 microKelvin. This step is completed with a device called a magneto-optical trap. The cooled atoms are then help in a “magnetic trap” that causes the warmest atoms in the cloud to separate from the cooler atoms; radio waves then push the warm atoms away, reducing the cloud’s overall temperature to less than 1 microKelvin. Thirdly, the cloud’s natural expansion causes the temperature to drop further (this is called adiabatic expansion) into the 100 picoKelvin range. In one year, the CAL instrument is expected to be fitted by astronauts with a new atom trapping cell that is currently being designed to deliver the AOM light pulses to the atoms. Brimrose has been making A-O Modulators and related components for more than 30 years. The modulators are used to control laser beam intensity, frequency modulation, frequency shifting, to control pulses and more. The AOMs are offered with conduction and water-cooled enclosures. Brimrose AOMs are offered from the ultraviolet to LWIR wavelength ranges for low and high optical power applications. They cover frequency ranges from just a few MHz up to 3.5 GHz. (For more information, contact Jan Kasprzak or call 410-472-7070). 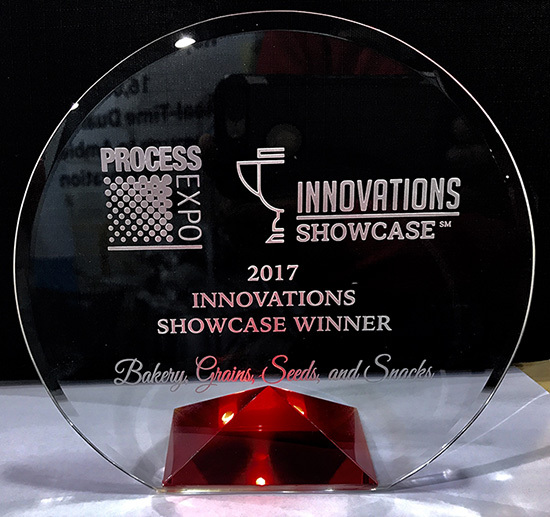 Photo 1—The Innovation Showcase Award Brimrose Recieved at Process Expo 2017. 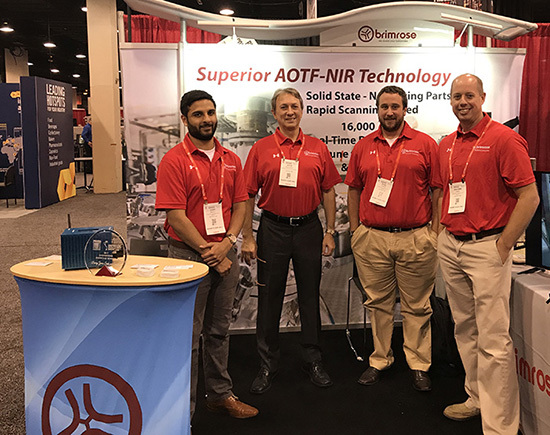 Photo 2—Brimrose staff at the Process Expo show. From left to right: Zubin Mehta, Steve Bohuczky, Evan Ramer, and Ben Fried. The Luminar 4060/4070 product represents a dual product offering which includes both the Luminar 4060 and Luminar 4070. Both spectrometers pack an extraordinary amount of features into a small box and offer low power consumption, no moving parts, an economic price tag, are USB capable and have an amazing scanning speed of 16,000 wavelengths per second. The 4060 is for laboratory analysis while the 4070 offers free space analysis. The Luminar 4060/4070 products service a wide variety of cross-market applications, including blend control, drying processing, pharmaceutical, agricultural/food, polymer, textile and pulp and paper. Examples of the successful use of these and other Brimrose spectrometers in the food industry include the measurement of: moisture and fat in baked goods; fat in milk powder; protein in meat and meat products; sugar and fiber in cereal; total sugar and brix in orange juice; oleic and linoleic acid in nuts and seeds; percentage of solids and protein in whey and fat; moisture and protein in butter; fructose and sucrose in honey, corn syrup and molasses; and acid in vinegar. The Brimrose Corporation has been make spectrometers for over 25 years, using its superior technology of Acousto-Optic Tunable Filtering (AOTF) for spectrometers operating in the near infrared (NIR) range. The company’s global universe of customers includes numerous Fortune 500 companies including Boeing, Bristol-Myers Squibb, Corning, Du Pont, Kerry, Kimberly-Clark, IBM, Kraft, Pfizer, Samsung and many more. For more information regarding our Brimrose line of spectrometers, please contact Ben Fried at 410-472-7070 or send email to office@brimrose.com. Our Acousto Optics Components Division is introducing a leading-edge OEM Optical Switch capable of switching an optical path in less than 30 nsec. Brimrose Optical Switch technology is based on a solid-state device (an Acousto-Optic Modulator) with no mechanical moving parts that is immune to vibration, hermetically sealed and suitable for rugged environmental installation. Our new generation of optical switches are suitable for telecommunications applications, including optical add/drop multiplexing and cross connect deployments, as well as fiber optic sensing applications. Brimrose optical switches offer low-insertion loses and low-power consumption and can deliver optical power up to 1W. These bidirectional switches operate in either 2x1 or 1x2 configurations. They are designed for single-mode or polarization maintaining optical fibers with customer-specified connector types. Standard units are designed for the C-Band. Other wavelengths are available upon request. Sparks, MD—The Binational Industrial Research and Development (BIRD) Foundation, a program funded by the U.S. and Israeli governments, has awarded Brimrose Corporation and Israeli partner File X an $800,000 two-year grant to develop a new generation of hyperspectral imagers. One potential application is identifying oil spills in the ocean. The joint program, entitled "Real-Time AOTF-based Hyperspectral Imaging System for Pollution Detection," relies heavily on foundational technology Brimrose has developed over the years using its Acousto-Optic Tunable Filter (AOTF) technology, which offers incredibly fast wavelength scanning speeds of up to 16,000 wavelengths per second, yet has the ability to precisely focus in on one wavelength. File X, based in Ness Ziona, Israel, is providing advanced software for the project, which will allow the new instrument to match the real-time wavelength image with images from a data base built into it. Oil pollution is an enormous global problem. The ability to rapidly identify an oil spill, and then quickly contain it, is critical. This is a primary goal of the unit being developed for the program. There are some 20,000 oil spills reported in the United States alone on an annual basis, according to the International Tanker Owners Pollution Federation. An estimated 1.3 million gallons of oil are spilled into U.S. waters annually, according to the U.S. Department of Energy. Cleanup costs, especially in those areas where oil spills are not identified and contained rapidly, run into the billions of dollars. Estimates for the cleanup for the BP oil spill in Louisiana were as high as $12.5 billion. Sparks, MD--Fresh off a major award from the BIRD Foundation, Brimrose joined the recent trade mission led by Maryland Governor Larry Hogan to Israel. The governor’s purpose was to increase trade and business with Israel. "We are excited that Maryland-based Brimrose Corporation has been named a partner in a major US-Israel Binational Industrial R&D Foundation (BIRD) award," said Maryland Governor Larry Hogan. "It’s just this kind of collaboration between Maryland and Israeli companies that was at the center of my recent trade mission." David Trudil, who directs Brimrose’s Biotech Division, was a member of the delegation. Trudil was involved with the Brimrose effort to obtain the BIRD Foundation award. The week-long trip involved a delegation of some 35 Maryland business leaders, academics and state officials. A number of agreements between Maryland-based institutions and Israeli organizations were signed. 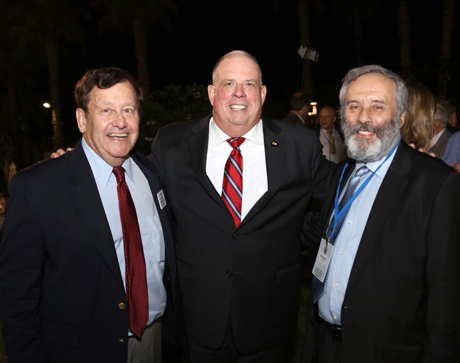 Maryland Governor Larry Hogan (center) joins Brimrose Technology's Dave Trudil (left) and File X's Alex Furlinder (right) at a reception in Israel. Both Furlinder and Trudil were instrumental in the granting of the BIRD Foundation award to the two companies. The Brimrose Corporation is refining and improving the acousto-optic components being used by its numerous fiber laser customers. The company is placing special emphasis on this product sector as it continues to craft and develop its large family of optical components. "It is remarkable how many of our acousto-optical component products have been integrated into fiber lasers in one way or another," says Brimrose Chief Technology Officer Jolanta Soos. "The sophisticated photonics required to make a good fiber laser represents a good match with our acousto-optic modules, switches, cavity dumpers, mode lockers, frequency shifters and pulse pickers." 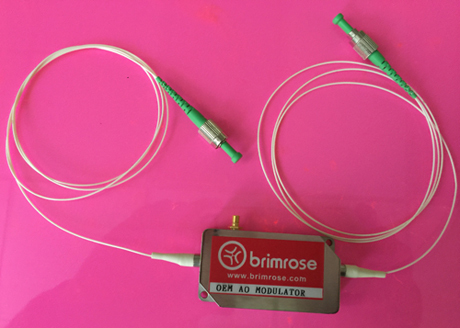 A new Brimrose OEM A-O Modulator is pictured. The units are popular with the fiber laser community. Photo courtesy of Brimrose. For example, Brimrose is coming to market with a new line of high-powered, fiber-coupled, acousto-optic modules (AOMs) that can withstand up to 5W of continuous wave optical power for lasers operating at 1.06 nm and 1.55 nm. Other wavelengths also are available on request. Brimrose’s new OEM/low-cost, fiber-coupled AOMs offer high-speed analog or digital modulation and high repetition rates for pulse-picking applications. The new fiber-coupled AOMs offer low-insertion losses and are packaged in compact size enclosures with customer-specified, fiber/connector types. Small-sized OEM driving electronics to complete the application are available, as well. The company also is bringing to market new, low-cost, high-powered, free-space AO Q-switches, Mode Lockers, Cavity Dumpers and Pulse Pickers in OEM packages that offer high-diffraction efficiencies combined with a high optical damage threshold. Brimrose’s high-speed AO Modulators and Pulse Pickers have a rise time of less than 10 nsec and its AO Frequency Shifters are in the MHz to GHz frequency ranges for wavelengths in the VIS to IR spectral regions. Brimrose has a variety of fused-silica and quartz-based products tailored directly for high-powered laser applications. For more information about Brimrose’s fiber laser components contact office@brimrose.com or David Chaffee at 410-472-7070. Headquartered in Hunt Valley, MD, Brimrose Corporation is a high tech and photonics company that specializes in acousto-optic components, spectrometers, hyperspectral imagers, and advanced materials research. Sparks, MD—Long known for its research and development prowess, Brimrose Technology Corp. (BTC) has been awarded two Phase I and two Phase II Small Business Innovation Research (SBIR)/Small Business Technology Transfer (STTR) grants in a matter of weeks. The total amount is nearly $2 million. Even by Brimrose Tech’s own high R&D standards—which have resulted in more than $100 million in federal contracts across its 30-year history—this is a major development. The company uses its R&D contracts to directly feed its strong product base. Eighty percent of Brimrose revenues come from product revenues. "It is gratifying to know that the U.S. government sees this amount of value in Brimrose Technology research," said Dr. Sudhir Trivedi, the director of R&D at BTC. "All of our customers, including the U.S. government, know that Brimrose will work hard to deliver what we say we will. These awards do not come in a vacuum. They are based on many years of successful collaborations and demonstrations and solid results." BTC has been awarded a Phase II STTR from the Missile Defense Agency at Redstone Arsenal in Alabama with BTC Senior Scientist Dr. Dajie Zhang acting as principal investigator. The objective is to demonstrate the feasibility of producing light weight and thermally manageable integrated optical systems suitable for airborne and space high power directed energy applications. This project will focus on improving two of the most important parts of a high energy mirror design, the highly reflective mirror surface, and the light weight and stiff multifunctional substrate. The award is for $999,477.00. The company also has been awarded a Phase II STTR from NASA Langley Research Center for $749,494 for "Acousto-Optic Tunable Filter-Based Polarimetric Spectral Sensor with Progressive Algorithm for Material Analysis and Mapping." Dr. Trivedi is the principal investigator. The STTR addresses the NASA Planetary Science Mission to advance scientific knowledge of the origin and history of the solar system and the potential for life elsewhere. The work expands on the AOTF-based SWIR spectropolarimetric imaging system developed in Phase I which will be further optimized and integrated with optimal algorithm/software in Phase II. BTC believes this will be a useful tool in determining the chemical composition and physical characteristics of planets of interest, short period comets, primitive meteorites and asteroid bodies, and in identifying the sources of simple chemicals important to prebiotic evolution and the emergence of life. The award is for $749,494. NASA has awarded BTC a Phase I SBIR regarding "Novel Approach in Fabrication of Shielding Composite Materials by Emerging Field Assisted Sintering Technique." The Principal Investigator is Dr. Trivedi. The objective is to develop a radiation shielding material system that is sufficiently strong to serve as a load-bearing structure. Such a materials system does not currently exist. The ideal shielding material for space applications should preferably be light weight with good mechanical strength and good thermal conductivity. BTC is proposing a novel approach to fabricate reinforced composite materials for radiation shielding applications using a powder metallurgy approach with sintering via the innovative Field Assisted Sintering Technology (FAST). The award is for $124,887. NASA has awarded Brimrose Tech a Phase I STTR related to "Instrumentation for Multiple Radiation Detection Based on Novel Halides for Nuclear Planetology." BTC is proposing a spectrometer that employs a single room temperature semiconductor detector that can perform both gamma and neutron spectroscopy. The proposed detector is based on novel halide materials. The halide materials are new wide band-gap semiconductor detector materials that can provide radiation detection with low cost, high performance and long term stability. BTC will be collaborating with Fisk University on this contract. The amount of the award is $124,859. BTC is the research laboratory of the Brimrose Corporation of America, a high-tech company involved in advanced materials development, AO components, near IR spectrometers, as well as high-tech solutions for the U.S. military. For more information, contact office@brimrose.com. Sparks, MD—Brimrose is introducing a powerful new tunable light source product line, the TLS 300 Series, which is based on Brimrose’s Acousto-Optic Tunable Filter (AOTF) technology. "This is a first," says Brimrose Chief Technology Officer Dr. Jolanta Soos. "There are no ultra-high-speed tunable light sources now on the market." There are a variety of applications for the AOTF tunable light source, including laboratory analysis and quality control in on-line applications. Specific industries seen benefiting from the AOTF tunable light source include the biomedical and medical communities, normal and fluorescent spectroscopy applications, quality and process control in the microelectronics industry, and microscopy R&D applications. The state-of-the-art units are powered by a 150 W Quartz Halogen lamp and feature high switching speed, trigger input/output, no moving parts, compact size and fiber coupling. This highly versatile tool incorporates many of the same functions as Brimrose spectrometers and in fact represents a major building block to that technology. The TLS unit provides illumination and can be integrated into a spectral imaging system. Brimrose, which pioneered AOTF technology some three decades ago, is offering three models of the product. One model operates in the wavelength range of 500-700 nm. A second model operates in the wavelength range of 650 nm to 1 micron. A third operates in the 900 nm to 1.6 micron range. Brimrose already has begun taking orders for the product. Custom options are available on request. For more information not provided on the website, send email to office@brimrose.com. Sparks, MD—Brimrose Technology Corporation (BTC) has received a Phase I STTR (Small Business Technology Transfer) award to develop a spectropolarimeter that will be capable of operating in the shortwave infrared. The amount of the award is $125,000. The analysis of polarized light can help discriminate and classify materials and identify objects, which is important as the National Aeronautics and Space Administration (NASA) contemplates a series of landing missions to other planets, comets, asteroids and outer planet moons. The measurement of the polarization state can also provide various characteristics such as surface properties, shape, shading and roughness, and can be used to identify unique features that will allow for more accurate discrimination between various materials than spectral data can by itself. Brimrose will be working with UMBC (the University of Maryland at Baltimore County) as its university research partner on the award. "Brimrose has a long history of helping NASA develop the tools and advanced materials necessary for NASA’s mission assignments," according to Dr. Sudhir Trivedi, Brimrose’s Director of Research. "The development of the proposed full-scope spectropolarimeter will offer a dramatically improved optical solution for material analysis by performing fast spectral profile acquisition." The research suggests a rich potential for commercial applications both inside and outside of NASA. For example, potential commercial NASA applications include material databasing, structural validation, use on missions for identification purposes, combustion spectroscopy, non-destructive testing of space-compliant parts, and qualification of time-sensitive materials in space. Potential non-NASA commercial applications include anomaly detection, countermine research, camouflage concealment and detection, and identification and discrimination of friend vs foe using optical taggants in military applications. There are also applications for atmospheric monitoring and the potential for on-line processing and feedback control in pharmaceuticals, chemicals, pulp and paper, and biotechnology. BTC is the research laboratory of the Brimrose Corporation of America, a high-tech company involved in advanced materials development, acousto-optic components, near IR spectrometers, and high-tech solutions for the U.S. military. For more information, contact office@brimrose.com. 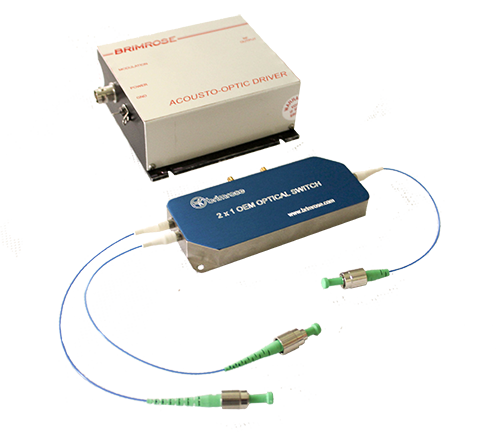 Sparks, MD—Brimrose Corporation is introducing a new line of fiber-coupled AO frequency shifters and modulators at OFC 2014 next week in San Francisco. The units are now available for purchase. The AO components have lower insertion loss and are more compact than comparable units. "The components have reduced insertion losses — on average 1dB — compared to the standard design," said Dr. Jolanta Soos, Brimrose chief technology officer and director of the Brimrose acousto-optic components division. A new line of fiber-coupled AO (acousto-optic) frequency shifters and modulators. Photo courtesy of Brimrose. 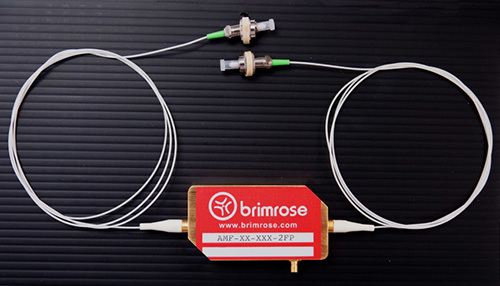 Brimrose AO components operate over a frequency range of 35-100 MHz and include customized fiber lengths of up to six inches. The Brimrose Corporation of America offers a comprehensive line of acousto-optic components, including tunable filters, modulators, deflectors, frequency shifters, mode lockers, q-switches and cavity dumpers. For more information not provided on the website, send email to office@brimrose.com. Sparks, MD—Brimrose Technology Corporation (BTC) has received a $150,000 Phase I STTR award from the U.S. Department of Energy Office of Science. The award relates to the use of next-generation, semiconductor-based radiation detectors using cadmium magnesium telluride (CdMgTe). The focus of the award, which includes SRI International as the research institute partner, is to improve on existing materials used for radiation detection by developing the new CdMgTe materials. BTC has been developing advanced materials for over two decades and has extensive materials R&D tools at its Maryland facilities. "This is another potentially significant step in the war on domestic and international terrorism," said Brimrose CEO Dr. Ron Rosemeier. "The rapid detection of nuclear presence is becoming a critical fact of life in today’s world." Washington, DC — Brimrose Corporation is introducing a new spectrometer here at the IFPAC 2014 Annual Meeting today that is based on and meets many 21st century customer demands. 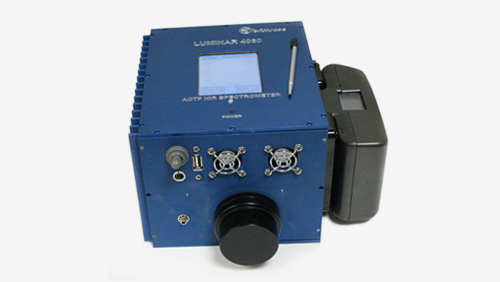 The new Luminar 4060 is a next-generation spectrometer that is highly capable yet comes in a small size, offers low-power consumption and has no moving parts. The unit includes a touchscreen display. Photo courtesy of Brimrose. "We are very excited to introduce the Brimrose Luminar 4060," said Brimrose Founder and CEO Dr. Ron Rosemeier. "The 4060 is the result of our integration of a lot of what our customers want with a lot of new technology. Customers told us they want a spectrometer that is small, has low-power consumption, has no moving parts and has an economic price tag—all with our AOTF technology. That’s a tall order but we are delivering it with the 4060." The unit is based on the same superior foundation as all Brimrose spectrometers, including acousto-optic tunable filter near infrared (AOTF-NIR) technology, which offers the amazing scanning speed of 16,000 wavelengths per second. "The perennially dependable Brimrose spectrometer has been placed in a new, better designed unit," according to Emil Ciurczak, spectrometer industry expert and author, and founder of Doramaxx Consulting. "The emphasis on miniaturization is more user friendly, as is the new software design, which has changed to a Linux operating system. It is very versatile and uses range from benchtop to a stand-alone wireless unit." Brimrose has been making spectrometers for 30 years and offers a complete family of spectrometers. For more information, contact office@brimrose.com. Sparks, MD - Brimrose Technology Corporation (BTC) has received two new Phase I STTR (Small Business Technology Transfer) awards. DARPA has awarded Brimrose Technology an award for $100,000 for a proposal entitled "Narrow Band Gap Quantum Dots and Quantum Wires for Mid-Wave Infrared Focal Plane Array Detectors." The DARPA proposal's objective is "to demonstrate the feasibility of producing quantum dot focal plane arrays for mid wavelength Infrared (MWIR) photodetectors." The study may extend the detection range into the long-wavelength Infrared (LWIR). RTI is a collaborator on the project. "These photodetectors will find many uses both in military and civilian applications such as night vision, surveillance, IR countermeasures and IR spectrometers," according to Dr. Dajie David Zhang, a senior scientist at BTC and the DARPA STTR project’s principal investigator. BTC also has received a new Phase I STTR from the U.S. Missile Defense Agency (MDA) focused on "Light Weight Optics for High Power Directed Energy Applications." The objective of the MDA award is to demonstrate the feasibility of producing light weight and thermally manageable integrated optical systems suitable for airborne and space high power directed energy applications. "This project will focus on improving two of the most important parts of a high energy mirror design, the reflective mirror surface, and the multifunctional substrate," according to Zhang, also the principal investigator for this STTR. Brimrose Technology is working in collaboration with Penn State University's Applied Research Lab on the MDA award. Washington, D.C. - Brimrose Technology Corporation is introducing a new generation of optical taggants which will again let the U.S. warfighter own the night and day in terms of being able to see and process critical information beyond what the human eye can see even with the help of 3rd generation night vision goggles. Optical taggants are target identifiers located on friendly or enemy personnel or material that enable the Warfighter to make critical decisions in target identification in a tactical environment. The announcement is being made here at the AUSA conference. Brimrose is supplying its highly advanced SWIR AOTF (Short Wave Infrared Acousto-Optic Tunable Filter) hyperspectral imager to provide the Warfighter with "special eyes" to find and locate TTL (Tagging, Tracking & Locating) taggants which are not observable by commonly used 3G night vision goggles, which are globally available. "The 21st century battlefield is evolving rapidly and for the U.S. Army to stay out in front of it we need to continue to employ tools and tactics that keep us ahead of those who would do harm to our nation" says Brimrose CEO Dr. Ron Rosemeier. "With these new taggants, we are opening opportunities at the edge that will make our fighting forces more effective." The SWIR AOTF hyperspectral imagers let the soldier in the field identify optical taggants at a highly specific wavelength which is outside of the commonly viewed IR frequencies. When the taggant activates or fluoresces, the soldier can track friendly troop and material movements. The soldier also has a Brimrose covert source invisible to the naked eye that he can track and locate which provides critical information about enemy troop and vehicle movement, weaponry, contraband, as well as being useful for other purposes. This source is also beyond the range of 3G night goggles. It is critical that the optical taggants only be seen by the observing party, the U.S. Warfighter. When all parties have goggles that can see the activated taggants, as is the case with 3G IR goggles, they lose their effectiveness. The new generation of Brimrose taggants can be seen only by those using SWIR technology. "The U.S. soldier must be in the position where he can make informed decisions" says Dr. Rosemeier. "U.S.-only readable optical taggants allow him to do that on a variety of fronts, including at the edge, where the gathering of enemy intelligence is critical." The optical taggants themselves are made of a proprietary fiber material. Brimrose performs materials research with nano-materials and quantum dots, both of which are used to make the next generation of optical taggants. The Brimrose hyperspectral imager and optical taggants will be demonstrated at the Brimrose booth (#1638) at the AUSA show Oct 21-23. Sparks, Md. - Brimrose, a photonics and high-technology company, is launching an exciting new capability as the company has unveiled a series of reconfigurable, multipurpose unmanned aerial vehicles (UAVs) for potential tactical, surveillance and emergency applications. The HERO using surveillance equipment to generate data is pictured. Photo courtesy of Brimrose. 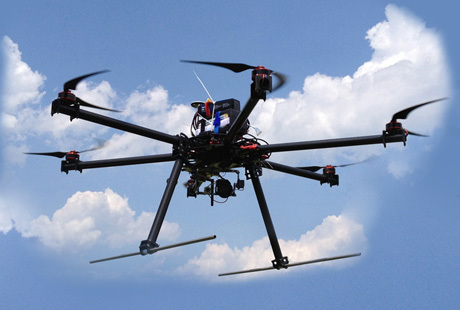 With the advent of HERO (Heli Engagement Reconnaissance Observatory), Brimrose has the potential to collect a wide variety of data from the air using sensing and other data-gathering equipment. "A core mission of Brimrose has been to help our clients better identify and characterize the environment and elements around them through our advanced acousto-optic technology and other products," said President and CEO Dr. Ronald Rosemeier. "By introducing controlled flight, HERO provides us with an entirely new dimension to use this sensing and data-gathering equipment extremely effectively." The HERO series—which already has undergone preliminary testing--includes a variety of power, weight and multi-blade options, and provides real-time, 360 degree view capability that includes both CCD Color Video and Infrared (IR) Night Vision. The series also offers auto return-to-home base and point-to-point GPS navigation. The drone offers up to 30 minutes of flight time and up to 13 pounds (5.9 kg) of custom payload. Some potential applications include active and passive target monitoring, crop monitoring, search and rescue, crowd control/monitoring, flood/fire disaster monitoring, and environmental monitoring. Brimrose is a world technology leader in the area of acousto-optic components, NIR instrumentation, and advanced materials for space applications serving the U.S. government and worldwide commercial industry since 1979. For additional information, send email to office@brimrose.com. The first award (CBD 13-104) is for an Acousto-Optic Tunable Filter-based (AOTF) Polarimetric Imaging System for Stand-Off Chemical Detection. Brimrose will apply its considerable understanding of AOTFs in the long-wavelength infrared (LWIR) region. The company intends to optimize the device fabrication techniques using mercurous halide materials. The goal for Phase I of the research is to develop and design an AOTF spectral polarimetric imaging system that uses an LWIR focal plane array as the detector. In Phase II, the system will be fully built and demonstrated. The variety of potential applications include remote sensing, pollution detection, environmental monitoring and mapping, automobile emission monitoring, and process control in the manufacture of foods, beverages, semiconductors, petrochemicals and pharmaceuticals. The second award (CBD 13-105) is for Development of Low-Cost Infrared Focal Plane Array for Passive Chemical Detection Using Colloidal Quantum Dots (CQDs). This research is being done in collaboration with Research Triangle Institute in North Carolina. The goal is to develop low-cost, long-wavelength infrared focal plane arrays (LWIR FPAs) using colloidal quantum dots of II-VI semi-metallic compounds. Brimrose intends to develop reliable fabrication processes to make mercury telluride (HgTe) CQDs, and methods to extend the capabilities into the LWIR range will be examined. The work is exploratory in that it has mainly occurred in the mid-IR range heretofore. This research has the potential to replace far more expensive sensors that only operate effectively at cryogenic temperatures. Also, the techniques used to fabricate existing FPAs are very expensive and have low yields of usable sensors. The Brimrose research may lead to far less expensive sensors operating at room temperatures that potentially could be helpful to first responders, fire fighters, and military post-blast reconnaissance teams.